We left off the nose theme with the quandary that the surface temperatures as measured about the height of the human nose in places humans frequent on the planet differs significantly in trend from measurements by satellite of various levels of the lower atmosphere and of the lower atmosphere (troposphere) as a whole. 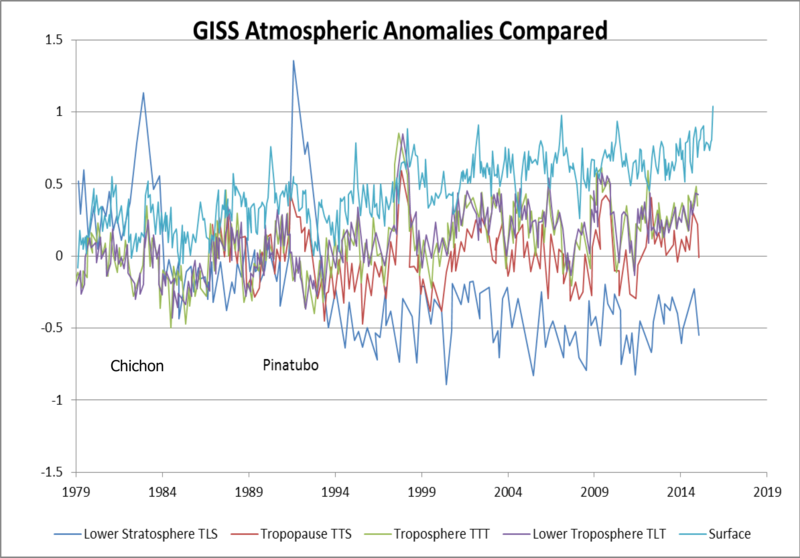 Clearly the altitude of our noses is warming faster than the other altitudes in the troposphere recorded by the satellites, and the lower stratosphere seems very flat since the two big volcanoes. In the Graphic above the various altitude temperature series are scaled with the middle of the range at their appropriate altitudes to allow a rough comparison with the lapse rate of the atmosphere. The lapse rate was scaled to fall amongst the profiles. A shorter series from the middle stratosphere is added and it seems to be cooling sharply. Everybody knows it gets colder when you go up in altitude. The reason for this is that the surface is the primary heat source for the atmosphere. 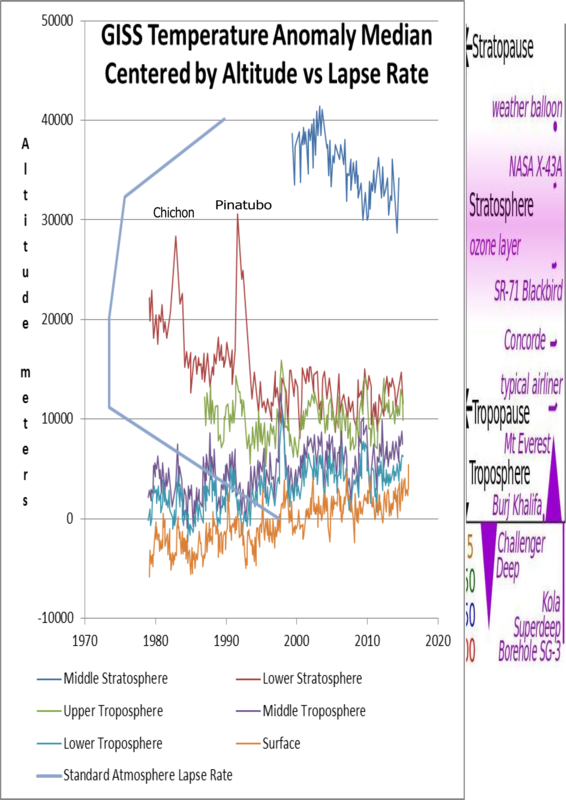 In the regions where the atmosphere cools quickly with altitude (the troposphere) the temperature series’ trended higher quickly from the beginning of the record in 1979 to about the millennium, and thereafter slowed way down or stopped increasing. In the lower stratosphere where the lapse rate goes to zero and begins warming again due to ozone the series does the opposite, declining during the period before the millennium and then flattening out. What about our noses? There are sooo many reasons to discount the surface temperature record. To begin with, the distribution of surface stations follows the human nose to wherever humans frequent. Antarctica has seven stations, making that one station for each 1% of the planet that continent covers, and they are all on the coast or on the anomalous Antarctic Peninsula. To get a less than laughable coverage of the planet statistically minded folks infill the unsampled area using the sparse existing data. Secondly, there is a striking bias in the results from recent “adjustments” to the data. This is what NOAA acknowledges. 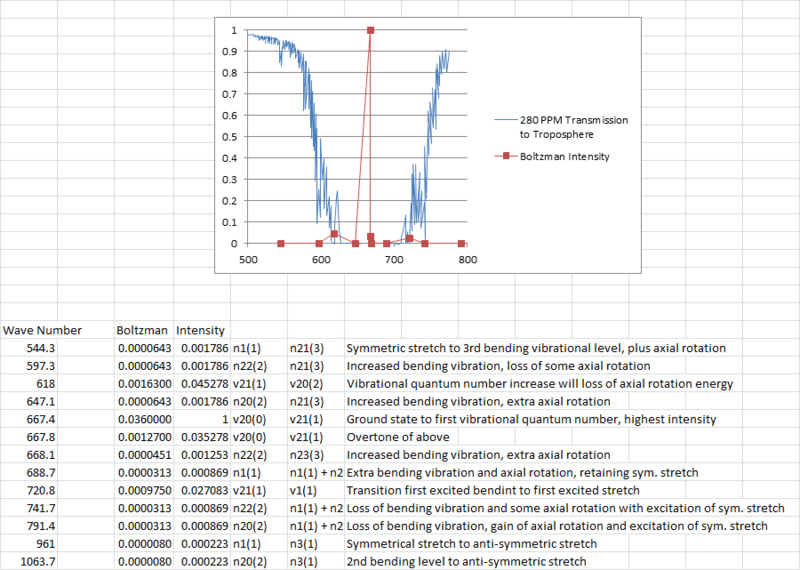 The vertical axis on this graphic is the difference between the raw data recorded and the adjustments. The trend is significant. This is just to 1999. Since then exponential further adjustments have been made. Steve Goddard shows the adjustments the US data since 2012. It is worth noting that the US is by far the best sampled real estate on the planet according to the station distribution two graphics back. Thirdly, surface thermometers re planted conveniently in front of human noses at airports and cities where all manner of activities converge to distort the temperature upwards. However, arguments can be made that the adjustments are legitimate. Rather than get into a rhetorical exercise, we take the much adjusted surface data at face value here. Accepting for the sake of argument that the temperature at the elevation of our noses is increasing faster than the rest of the atmosphere, what does that mean? Some would have it be our rude flatulence of gases. The primary excrescences of combustion are water and Carbon dioxide in a ratio of 2:1. By curious fate these happen to be the two most important “greenhouse” gases that slow the escape of surface energy to space. Of the two water is by far the most important. It has over 3700 excitation states compared to CO2’s 13, and its absorption bands span the entire spectrum. It not only slows surface energy’s escape to space, it captures and thermalizes incoming solar radiation as well. Another important difference between the properties of these gasses is the tendency to disperse. CO2 mixes so well that monitors in Antarctica, Hawaii, and Alaska show the same concentration. Water is very strongly concentrated in the surface layer of the atmosphere and its uneven horizontal distribution basically describes the vegetation zones on earth. All that water coming out our “pipes” right next to the surface thermometers must surely be part of the reason they read higher, but this effect could still be a problem as it is a greenhouse effect warming the “planet”. Another reason the surface thermometers read higher that is not warming the “planet” follows from a surprising property of CO2. It is “too good” a greenhouse gas. Its primary excitation states are so efficient at gobbling up surface energy that none of it currently survives the first 100 meters of the atmosphere. In the graphic above CO2 excitation wavelengths and their Boltzman densities are plotted against a cartoon of transmission. You can see that 8 of the 13 CO2 excitation wavelengths have zero transmission at 280 ppm, the pre industrial or “natural” level. What this means is that even before significant human excrescence no energy was escaping to space in these wavelengths. A good round number would be that half of the excitation potential of CO2 is nullified at pre industrial levels because it is so bloody good at gobbling those photons. Adding more CO2 is just beating a dead horse in these bands. No additional greenhouse effect can be created. What CO2 additions do in these bands is lower the altitude of energy exhaustion and move the thermalization closer to the surface thermometers. They read warmer, not because the planet is warming, but because the same amount of energy is brought closer to them. About half of the CO2 we put in the air does nothing more than warm our noses. This entry was posted in Climate, Energy of Photons, Photon, Spectra and tagged nose warmers. Bookmark the permalink.